Each year, tens of thousands of people tackle the Incline, an odd, brutal little trail that rises straight uphill out of Manitou Springs, Colorado. They go there to train, to test themselves, to prepare for the next race, the next mountain, the next adventure. “I get up early, head down to Manitou. Got it in my head exactly what I’m gonna do. It’s a sickness I just can’t lose. I got the Incline blues. Beagle, 62, has lived in the Pikes Peak region for 11 years. 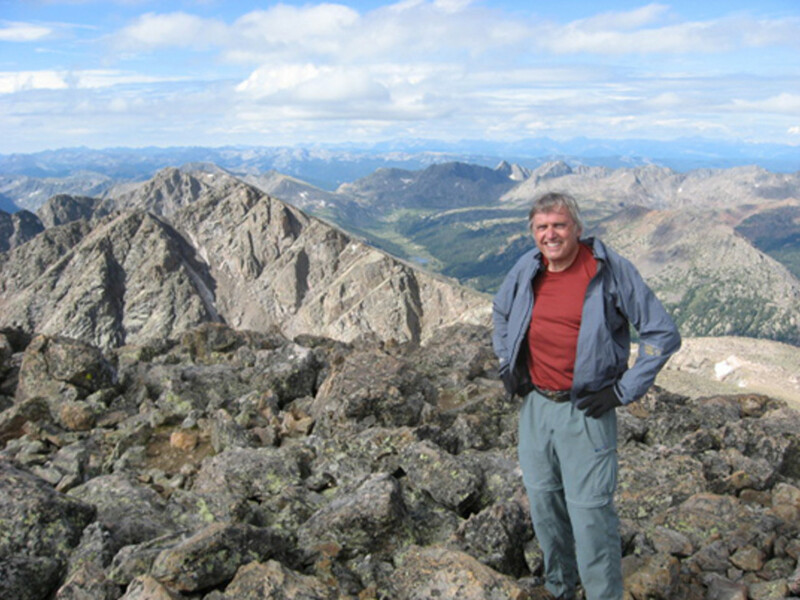 He spent most of his professional life in communications, first in television and then working for the Ohio Division of Wildlife, the Wilderness Society and the City of Colorado Springs. Laid off from his city job 2 ½ years ago, Beagle now works as a freelance writer/videographer, part-time ski instructor for Vail Resorts at Keystone and self-titled “cellar rat,” or winemaker’s assistant at the new Catriona Cellars, a winery in Monument. His wife, Susan Davies, is the executive director of the Trails and Open Space Coalition, a local non-profit formed to protect parks and open spaces in the area. Their daughter, Elizabeth, 14, is a budding ice skater. This year, Beagle is a member of the Triple Crown Runners, a racing team dedicated to completing the Triple Crown series of races: the Garden of the Gods 10-Mile Run, the Summer Roundup Run and either the Pikes Peak Ascent or Marathon. 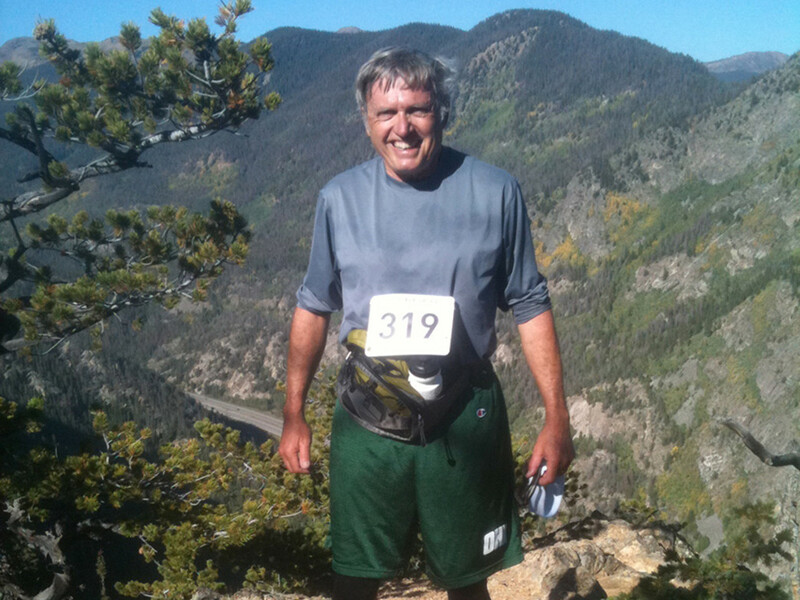 The 7-member team (nicknamed the Mighty Marmots) is sponsored by PikesPeakSports.us and the Triple Crown of Running. Beagle is, he says proudly, the oldest (“434 in dog years”). The team had a purple and gold presence at this year’s Ascent, which Beagle finished in 5:16. Beagle says he has been running most of his life. Born and raised in the Finger Lakes region of upstate New York, he was an only child. 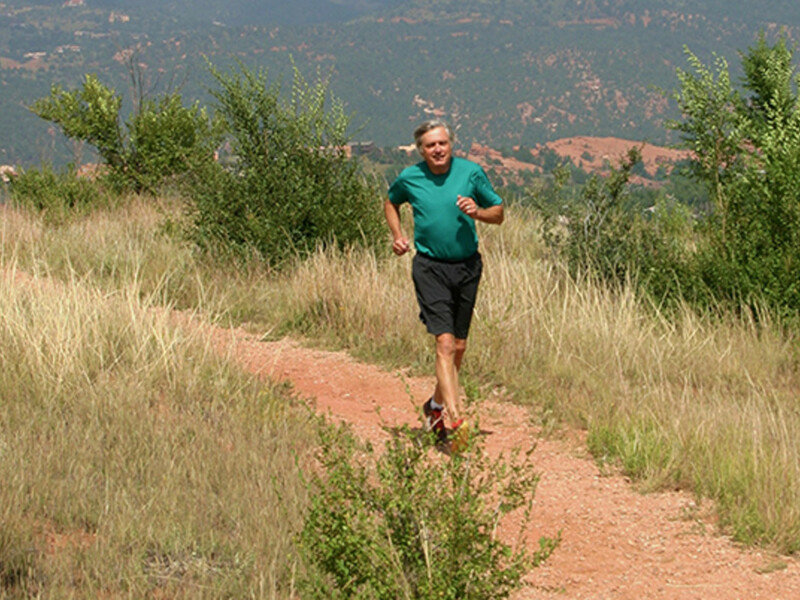 Beagle says he loves running on hills and has learned that training on the toughest terrain you can find is the way to prepare for a grueling race like the Ascent, the 13.32-mile uphill on the Barr Trail that ends on the 14,115 foot summit of Pikes Peak. These days, Beagle spends a lot of time on trails near his home in Monument. Current favorites are Spruce Mountain, a pine-and-fir shaded mesa three miles north of Palmer Lake in Douglas County, and Mount Herman, a prominent peak that forms the backdrop for Monument. He doesn’t have a rigid running schedule. When he was training for this year’s Ascent, he tried to get in 20 miles a week. And when he isn’t running, he is hiking with his family. In the winter, he teaches beginners to ski. That physical challenge aside, Beagle says a normal run on a beautiful day gives him a chance to step back from his life.